So you have a wireless network connection at home but is quite slow for some days? There are so many ways to hack inside the wireless network router that anybody could be using your connection without permission. So how would you know if someone is using your wireless network connection? Even if you are not a Windows network expert, you can now still find out whether someone is using your connection or not. 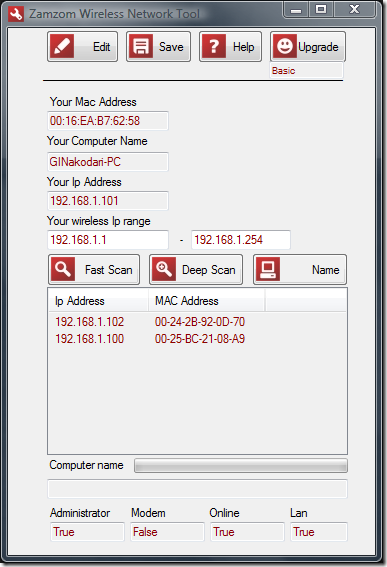 Zamzom Wireless Network Tool is a free utility that can do a quick scan for you. Just load it up, hit Fast Scan and it will show you the IP and MAC addresses of every computer that is connected to your WAN. You can also perform a Deep Scan, but a Fast Scan will be enough for most users. It can also show the name of the computer that is connected but you will have to upgrade to Pro version(which will cost some bucks). You don’t need to know the name of the computer, since you can block the IP address easily through your router.